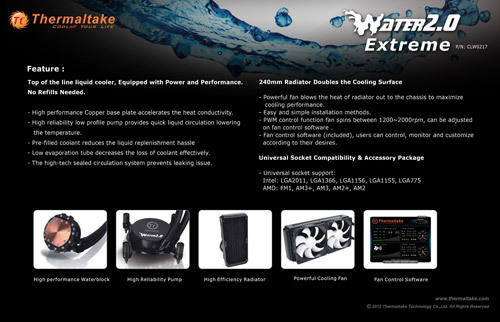 Taipei, Taiwan – May 9, 2012 – When it comes to choose a liquid cooling system (LCS), users are often astonished by its performance and overwhelmed by the complex setup. 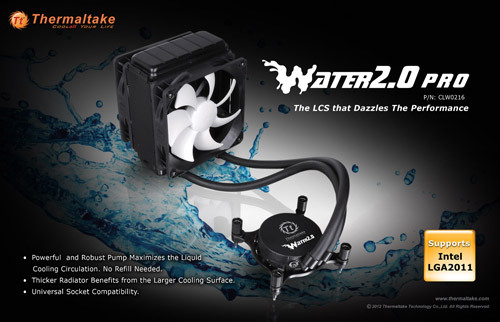 Thermaltake, being the industry pioneer brand with expertise in PC thermal solutions, is thrilled to introduce the all new LCS – the Water 2.0 Series. 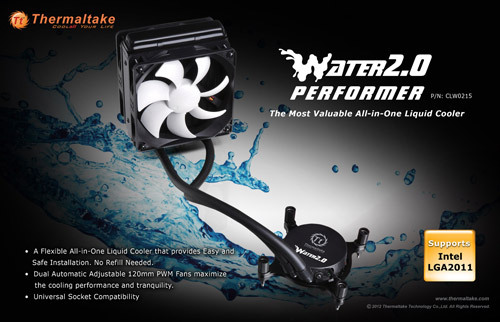 Featuring the all-in-one LCS solutions for users with different enthusiasms, it includes the Water 2.0 Extreme, the Water 2.0 Pro and the Water 2.0 Performer. 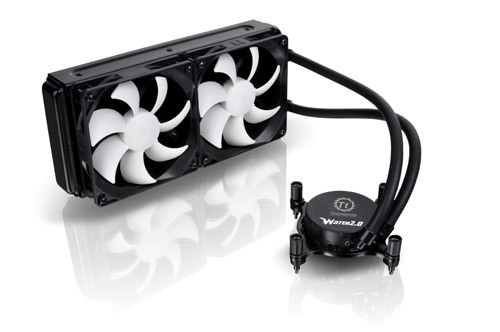 The new Water 2.0 Series made setting up just as easy as it cools. 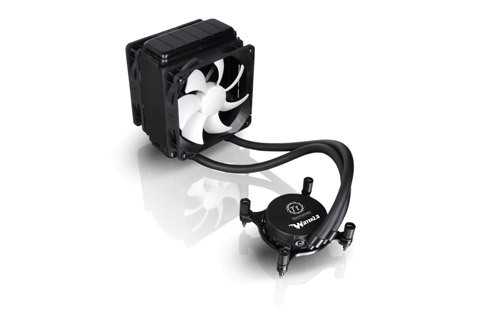 For a LCS, enthusiasts not only looking for an easy and clean setup to efficiently calm the roaring CPU, and if possible, they also look for the best low-maintenance solution too. 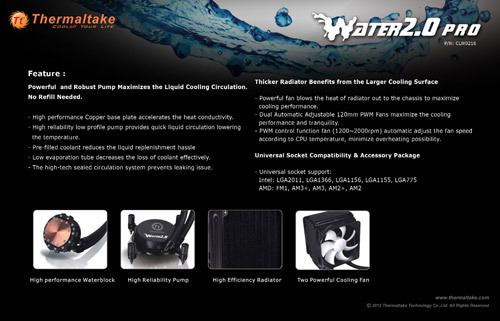 The new Thermaltake all-in-one LCS Water 2.0 Series is formed to support these desires of enthusiasts. 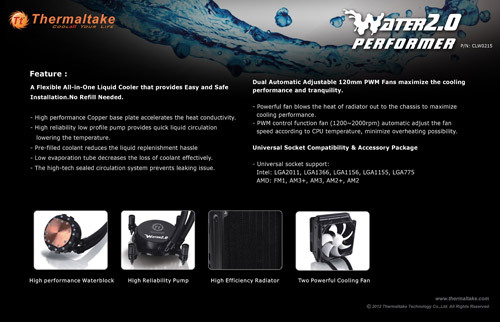 The entire Water 2.0 series comes with a standard full copper base plate for better heat conductivity, a powerful pump within the waterblock for a rapid water circulation, dual 12cm high airflow fans for faster heat dissipation, and two low evaporation tubes effectively decrease the loss of coolant plus the high-tech sealed circulation system to prevent leaking issue. Yet, each model’s radiator has been refined accordingly to manage different specification. 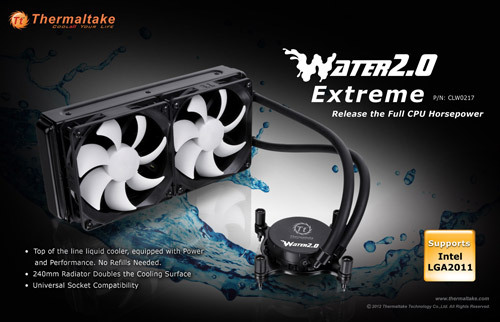 Extreme has a special designed 240mm large surface radiator and the support of two more 12cm fans for additional heat dissipation, targeting towards user who is always looking for the best with large chassis space. Plus, a window base software to monitor and customize a wide range of parameters, including pump speed, coolant temperature and fan speed. Pro has a standard radiator with twice of its thickness, aiming toward mainstream people who requires a superb performance, however does not have enough chassis space to install an Extreme. 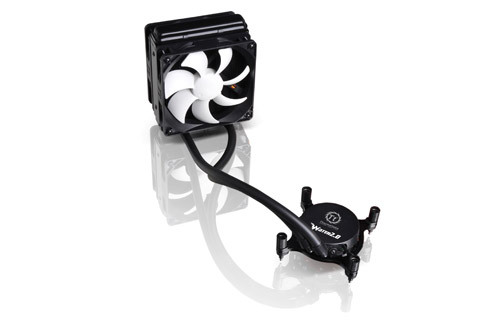 Performer has a standard size 120mm radiator, a perfect size to fit into various chassis, aiming toward first-timer who is new to LCS or who is troubled by the tradition LCS and wanting a easy way out.